IAG – who owns it? Whilst his Air Asia low-cost operation based in Kuala Lumpur continues to thrive some other projects of Chief Executive Tony Fernandes are proving to be less of a success. Last week it was announced that Air Asia Japan, a joint venture with ANA, is to be closed in October this year after a little over 12 months of services. It seems that the idea of flying ‘budget’ class did not fit into the Japanese mentality. The four Airbus A320 aircraft involved will return to the ANA main line fleet and the routes integrated into the airline’s system. Now in its third year Business Aircraft Europe will take place at Biggin Hill Airport 11 September – 12 September 2013. Biggin is somewhat of an anomaly in that it is perceived as being in Kent, but is actually in the London Borough of Bromley, being with London City and Northolt the only executive airports actually within the capital city. Biggin is not licensed for commercial jets, has a main runway 1800m long and an elevation of 600m. It is 15 miles from the Bank of England. The Secretary of State for Transport Patrick McLoughlin MP has been down to Heathrow’s Terminal 2 to see how the project is moving along before it welcomes it first passengers on 4 June 2014. British Airways is to introduce services from London City Airport to Dusseldorf from 1 September. There will be three return flights on weekdays. The route will be flown by a 50-seat Saab 2000, wet leased from Eastern Airways in full BA livery. The aircraft previously was used on a route to the Isle of Man which will now be a single Embraer 170 rotation instead of the three-service frequency. Air New Zealand has confirmed that its new fleet of 10 Boeing 787-9 aircraft will operate on routes to Honolulu, Papeete, Perth, Shanghai and Tokyo. 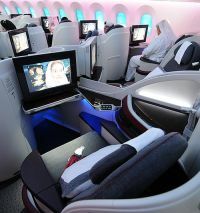 The latest destinations for Doha-based Qatar Airways as it expands its Boeing 787 Dreamliner fleet have been announced. During the Paris Air Show we managed to track down Isaiah Cox, the outspoken leader of WheelTug, the aircraft front wheel ground self propulsion system. Mr Cox is a London-based American and Princeton graduate who founded WheelTug, and the electric motor company that supplies the enabling technology that allows for a 25-knot system capable of driving a fully loaded narrow-body aircraft – using a motor less than 5 inches wide. The latest WheelTug demonstrator was static in Hall 5E. It remains to be seen if for Farnborough, the theatre that is the air display, allows for what would be a silent ground manoeuvering demonstration. It is a thought in any event. Mr Cox believes that the Airport Commission should take a close look at what the industry now refers to as "E-taxi". Dublin-based Aer Arann seems to be thriving under the Aer Lingus franchise banner. Whilst the airline is owned by a consortium led by the Stobart Group called Everdeal Holdings Ltd, which is owned 45% by Stobart; 42% Invesco; 8% Cenkos Securities; and 5% Pádraig Ó Céidigh, Aer Arann's former Chairman. It is effectively run on a day-to-day basis by Aer Lingus with EI stalwarts Simon Fagan as Chief Commercial Officer and A330 Captain Davina Pratt looking after the technical side. Sean Brogan is now Chief Executive and comes from Stobart Ireland. The Airline Public Relations Organisation (APRO) held its summer networking party last week in the basement of Morton’s Club in London’s Berkeley Square. Hosted by Los Angeles International Airport (LAX) most major London operating airlines were represented (with several notable exceptions), the venue very congenial but rather dark and noisy. Around 45 press, of various persuasions, checked in. Francine Sheridan, LAX Director Europe, made a short presentation emphasising the airport’s connectivity and plans for the future. Late 2013 will see the launch of the rebuilt Tom Bradley International Terminal part of a US$4bn investment programme. There are currently more Airbus A380s operating at LAX than any other US airport, with six daily flights. The Dublin press reports that Air France-KLM is negotiating to sell its loss-making London City centred CityJet (WX) unit to a German corporate rescue firm. In fact CityJet is two airlines marketed as Air France, CityJet itself (25 Avro RJ85s) and VLM (15 Fokker 50s). Virgin Atlantic has another semi-sibling, this time a little closer than Virgin Blue and Virgin Australia. Delta Air Lines purchase of almost 49% of Virgin Atlantic was completed last week allowing the two carriers to cross-sell tickets (see BTN 24 June). With Sir Richard Branson extremely visible at all joint activities the new relationship is likely to be much more commercially aggressive than with Virgin’s previous part-owner Singapore Air Lines. Business travellers should not be too alarmed as the London airports make out their cases for the Airport Commission to consider, and rather like the airlines, say how hard done-by they are. Gatwick will be submitting its final suggestions to ‘Davies’ over the next couple of weeks which will include a second runway. The £5bn project can be funded privately according to the airport’s CEO, Stewart Wingate. 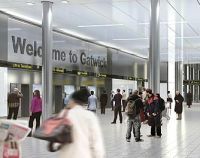 Gatwick is owned by a consortium led by Global Infrastructure Partners, an investment manager, and the Abu Dhabi Investment Authority, the sovereign wealth fund. Spanish bank Bankia has sold its 12.1% stake in IAG (British Airways, Iberia and Vueling) to institutional investors last Thursday for £580m. 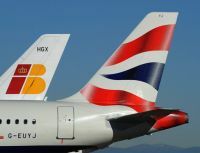 An International Airline Group (IAG) spokeswoman declined to say who had purchased the shares. Wizz Air, Geneva-based and claimed to be the largest budget airline in Central and Eastern Europe, is to introduce flights from Luton to Kosice, Slovakia’s second largest city. The route commences 17 September, initially twice weekly and will increase to four flights per week from 27 October. In a major air travel survey many years ago, consumer response dreamed wistfully of a need to be “cocooned in a haven of tranquillity, away from the stresses of life on the ground”. 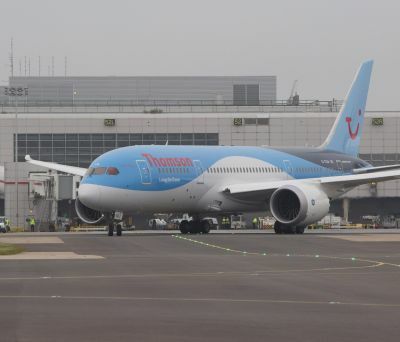 Although rather joyful on-board celebrations didn’t exactly make Thomson Airways’ introduction of the UK Boeing 787 passenger service a wholly tranquil experience, this most advanced aircraft does appear able to fulfil that long-held passenger dream. No surprise, then, about Boeing dubbing it the ‘Dreamliner.’ Nor about Thomson naming its first 787 ‘Living The Dream'. Our final comment on the Paris Air Show must highlight Qatar Airways' chief, Akbar al Baker, a keen follower of the British scene. He must have been watching BBC TV which highlighted a British minister walking into 10 Downing Street with visible Cabinet papers in his hand. These were snapped by the paparazzi and subsequently published. British Airways took delivery of its first Boeing 787 Dreamliner last week at Heathrow and plans to introduce the aircraft on the Toronto route from 1 September and Newark New York from 1 October. The official roll-out, together with the Airbus A380, will take place at Heathrow’s engineering base next Thursday (4 July). G-ZBJB is the first of 24 Dreamliners that will arrive by 2017. BA has announced plans to convert further options for the aircraft into firm orders for delivery from 2017, including for the new larger 787-10 version. Other orders in the pipeline include 12 Airbus A380s (with the first aircraft, as noted, delivered) and a further six additional 777-300ERs. In April owner IAG announced an 18-strong commitment for the Airbus A350-1000. Bombardier has put back the first flight of its new CSeries jet for “up to a month”. The much delayed aircraft was due to fly by the end of June. Only a week back the company had been making promising noises regarding the maiden sortie saying that ground vibration tests and software upgrades were complete and that it has applied to Transport Canada for the flight test permit. 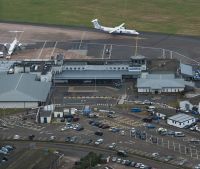 Balfour Beatty has sold its 60% share of Exeter Airport to Patriot Aerospace, the aviation division of Rigby Group. No financial details were disclosed. EasyJet will continue with flights between Inverness and Gatwick next year when it becomes the sole carrier between the Highland capital and London next year. No decision has yet been made on the three times daily Newquay - Gatwick route which Flybe is giving up at the end of March 2014. Newquay, rather like Inverness, is also served by easyJet, this time by a three times per week summer only route from Southend. The consequences of no air links from Cornwall to London are serious for the most remote English south west county. Part of the French Accor Group, which includes Formule 1, Ibis, Mercure, MGallery, Novotel, Pullman and Sofitel, is expanding fast. In London last week Accor CEO Yann Caillère declared: “Mercure is essential for the group’s expansion particularly driven through franchises and managed hotels. The brand is now opening a new page in its history. Thanks to the work carried out in partnership with our franchisees and to its powerful distribution, Mercure is increasing its attraction for hoteliers and guests alike and injecting new impetus, modernity and innovation into midscale hotels”. The Australian air transport regulator has published a report which blames Rolls-Royce for a mid-air failure of a Trent 900 engine on a Qantas A380 in November 2010. The matter now appears to be closed. Finnair’s new Chief Executive Pekka Vauramo says that he sees the advantages and disadvantages in a possible merger with Scandinavian airline SAS. He was speaking during an inaugural flight from Helsinki to Xi’an and reported in the Finnish national media. "Our largest shareholder (the Government of Finland) is currently thinking along those lines" of a possible merger. Vauramo was appointed earlier this year to complete a turnaround started by predecessor Mika Vehvilainen.